One of the nicer areas of Jakarta to visit is Ancol in North Jakarta. So called Jakarta beach there is a fee for cars to enter so relatively quiet area. Many people from Jakarta and Java visit here on weekends so can get busy. This is a great place to take the children as have amusement parks, Sea World, waterslide park, a small 9 hole golf course, sailing boats and some great seafood restaurants. 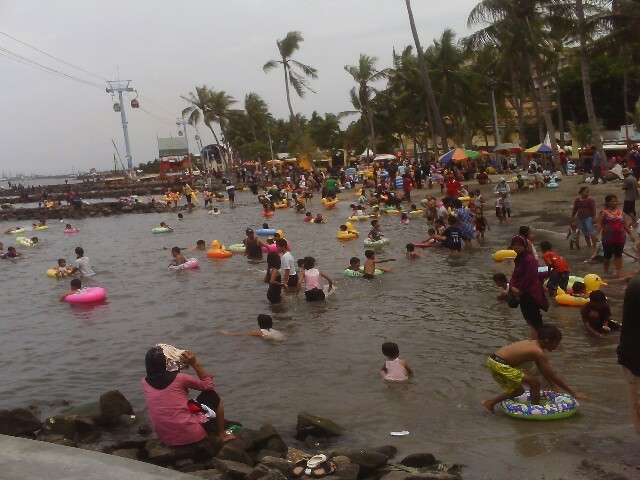 Although the locals have their children swim in the sea it is very polluted as Ancol is surrounded by industrial areas including the largest seaport in Indonesia. From Ancol you can catch a ferry or speed boat out to some beautiful tropical islands. Pulau Seribu (Thousand Islands) are located around 2 hours by ferry or 45 minutes by speed boat. There is not exactly 1000 islands, but a few dozen beautiful tropical islands with white sandy beaches. There are a few beach resorts accommodation on the larger islands. There are some good places around the islands for snorkelling and scuba diving with a good variety of fish. Dunia Fantasi, located in Ancol, is the largest theme park in Jakarta. With loads of thrilling rides like roller coasters, Tornado ride, Water rides, Priate ship ride and lots of smaller rides for small children. Check out the Dunia Fantasi website. Other adventure parks include Atlantis Water Adventure and Ocean EcoPark. There are a few wildlife parks found in Ancol including Seaworld and Samuda Dolphin Park.